The use of honey in wound care has received increasing attention in recent years, mainly as a result of improved formulations, increased availability, supportive research, clinical efficacy reports and numerous positive reports in the national and international press. These have all contributed to the renaissance of honey as a therapeutic agent, in particular, its use as an antimicrobial agent which neatly confronts the increasing number of reports on the problem of antibiotic resistance. The therapeutic advantages of honey have been recorded by Molan (2001) and tabulated by Cutting (2007) Table 1. Good practice dictates that before first application of any honey product the patient should always be assessed for risk of reaction/allergy to bee or honey products and asked about known sensitivities. Adverse effects from application of honey are rare and although Molan (2001) records that patients find honey soothing and non-irritating some clinicians report that a small number of patients may experience a stinging sensation (Vandeputte & Van Waeyenberge 2003). It has been stated that not all honeys are the same and for this reason honey should not be considered a generic term (Molan 2002). Consequently, with the introduction of a new honey product it should not be assumed that painful reactions following application may occasionally be expected. 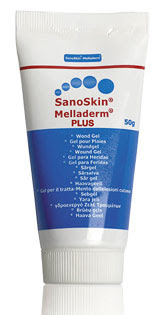 Melladerm® PLUS is intended for use in all types of wounds, including burns and is derived from Bulgarian (BULGARIA H) mountain flower honey. Bulgaria H has been selected on the basis of its excellent wound healing properties. Melladerm® PLUS is a proprietary wound ointment/gel that contains 45% BULGARIA H and a mixture of ingredients including glycerin and polyethylene glycol 4000 (PEG 4000) to make the honey dressing more user friendly. PEG 4000 is a blend of water soluble polymers and its use as an additive to honey has been assessed by Subrahmanyam (1996).